Diamonds or Sapphires: Which will truly capture your heart’s desires? Do you feel your heart calling for the sapphire, or vice versa, but worried that others would expect you to opt for the traditional luxe diamond? Or just don’t feel like settling for any old engagement ring that could end up resembling your co-worker’s or the next girl’s on social media? An engagement ring is supposed to be a gift that embodies everything you ever wanted and to mark a beautiful milestone in your life, so the rock of choice ought to be something to remember as well. In terms of durability and strength, both gems come in very close on the Mohs scale of hardness. Diamonds of course hold the title of scoring a perfect 10 on the scale, hence why they are more sought after for investment’s sake. They are known to scratch far less, if at all, than sapphires and very rarely need to undergo repolishing. Although sapphires score a 9 on the Mohs scale, the gap between the two is surprisingly wide; diamonds are actually 4 times harder. 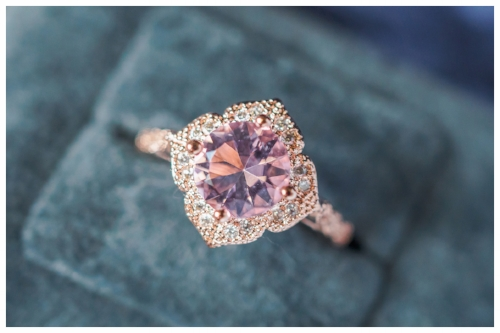 Though primarily known for their deep ocean blue shade, sapphires have the advantage of providing a very versatile palette for a plethora of engagement ring options. Popular colors for engagement rings can also include green, pink, peach, purple, yellow, and white. Some women might have concerns of a sapphire ring not being recognized as an engagement ring, as well as not being able to easily match with different outfits. Choosing a white sapphire would be an effective option if you prefer to lean towards the classic, versatile look of a diamond engagement ring. Selecting other neutral tones such as peach, pale pink, and light yellow, especially with rose gold as the leading metal, is certain to make jaw-dropping combos. On the one hand, the brilliance of a diamond and its special ability to refract light might be no match for any gemstone. On the other, sapphires are about being bold and rich in color which is the very essence and value of their beauty. Besides, if you want a sapphire as the center stone but still want that extra sparkle, you can always try incorporating a micro pavé diamond band, halo, or a three stone setting to really get the best of both worlds. Some are under the impression that a sapphire engagement ring is indicative of the fiance being on a budget or taking the cheaper route, but this isn’t always the case. A sapphire or any other non-diamond engagement ring could actually signify more thoughtful meaning and personalization behind the couple’s choice. It has been suggested that some people may prefer diamond rings because the stronger the stone, the stronger the expression of their bond is. It’s true diamonds are the most durable of them all and are considered the classic for a reason. Sapphires, though, can prove to be a great alternative for those who don’t want to follow engagement ring norms. Nonetheless, you can’t go wrong with either of the two, so make the decision based on which details and factors matter most and what it personally symbolizes or means to you. And whether it be a diamond or sapphire on your finger, make sure it is something you are proud to wear and show off every time you do.